Join us to celebrate this day dedicated to St. Valentine, the patron saint of lovers, engaged couples and happy marriages. 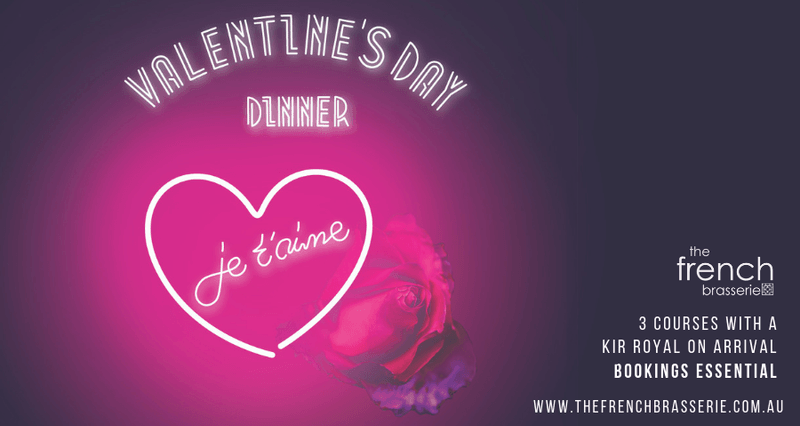 We all know that French is the language of love...so if you want to give the one you love a night they will never forget, it's time to start planning your special evening with us. Show your appreciation to that special someone and book a table with us this Valentine's Day. With 2 sittings at 6:00pm and 8:00pm, our special menu has been designed to capture the beauty and romance of French cuisine. Enjoy a delicious 3-course set menu with a complimentary Kir Royal upon your arrival. Bookings are a must, as this is by far one of our busiest days of the year. We look forward to treating you and your paramour to an evening of fine food and romance.